Weather Underground: Weather Underground provides weather information for worldwide locations, including current conditions, hourly forecasts, radar and satellite maps. Specialized weather products include severe weather alerts, hurricane tracking, ski and sports weather, marine and aviation weather and user-contributed photographs. UM Weather: This page provides access to the latest condition reports for nearly 200 US ski areas, as well as mountain weather reports directly from the National Weather Service. SkiWeather is the ultimate source of ski weather information! SnoCountry Mountain Reports: Find current snow conditions, ski mountain details, ski resort information and more details about skiing in on SnoCountry.com. The Weather Channel: Snow and Ski conditions and extended forecasts for ski resorts across the world from weather.com. GoSki: The worldwide guide to ski resorts and mountain sports – over 2000 ski areas! Ski Central: The #1 Search Site for Skiing and Snowboarding. Intellicast: The Authority in Expert Weather. Local, National and Global weather conditions and forecast, radar, satellite, interactive weather maps, severe weather alerts and weather reports for your professional and personal life. Get free, 24X7 weather brought to you by WSI – ‘the disruptive weather company’ – and the source of weather for the FAA, hundreds of TV stations, and the nation’s top airlines. On The Snow: Provides the Snow Report, Cams, Deals, and Ski Resort Reviews for over 2,000 ski resorts worldwide. On The Snow is primary source of all snow reports on the web. Ski Southeast: SkiSoutheast.com and SkiNC offer the most up to date ski and slope conditions for all of the Southeast and Mid Atlantic Ski Resorts. 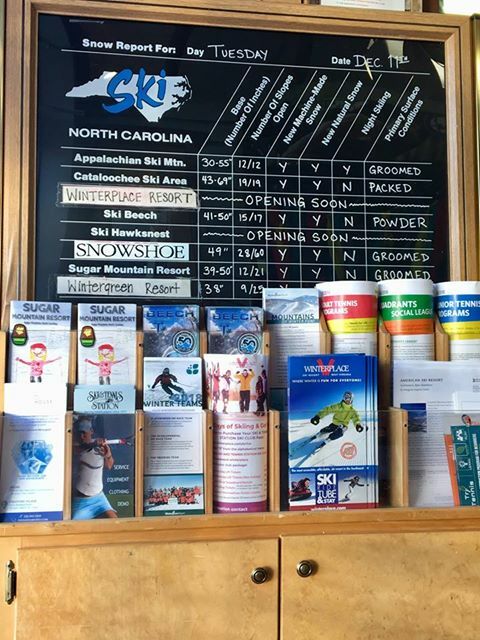 North Carolina Ski Resorts: A directory of United States ski resorts including links to resort web sites, maps, directions and weather forecasts. Cross Country Skier: North American’s premier Cross Country (Nordic) skiing publication, with articles, photos, event listings, on-line magazines, video, techniques and training guides, and destinations. CUS Road Condition: Where to find North Carolina Highways – travel road condition updates with live traffic cams, North Carolina highway travel weather maps, and North Carolina road information updated. US WeatherLook: How To Find Weather forecasts,reports and live weather cam looks of all 50 states. Wold Ridge Ski Resort: Snow skiing and snowboarding at Wolf Ridge Ski Resort in western NC, just minutes from Asheville. Perfect for families and groups. Spend your winter vacation at Wolf Ridge Ski Resort.